We all know that LeBron James has game when it comes to dominating opponents on the hardwood, but now it also looks like he's got some serious skills when it comes to celebrating birthdays as well. 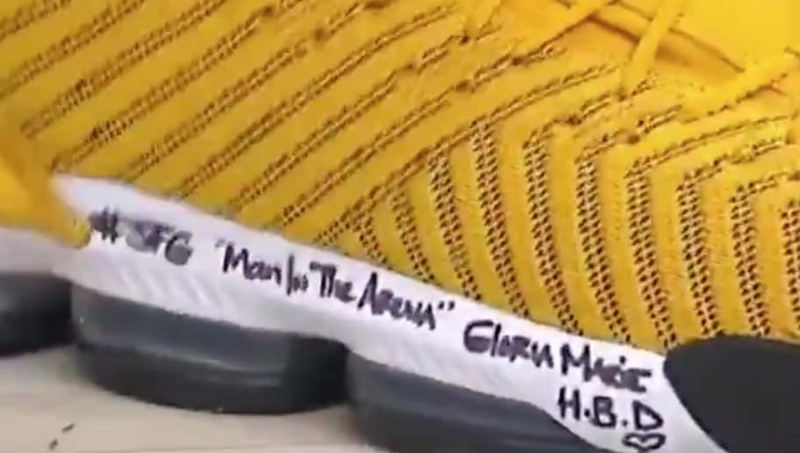 Before the Los Angeles Lakers tipped off against the Indiana Pacers on Tuesday night, cameras spotted a special happy birthday message written by the King himself to his mother, Gloria Marie. He definitely took writing birthday cards to a whole new level with those kicks, which of course were just one of many well wishes from the superstar to his hero. The last time that ​LeBron played on his mom's birthday he celebrated in the best way he knew how by dropping 30 points against the Boston Celtics back in 2016 while adding seven boards and four assists for good measure. Lakers fans are hoping that James can tap into some of that birthday magic against the Pacers to help snap a stretch of five losses in seven games. Hopefully, he can blow the candles out against Indiana.